Hector, Marco and Karina Gagnon, our passionate distributors and installers for the Hautes-Laurentides region, offer you professional services. 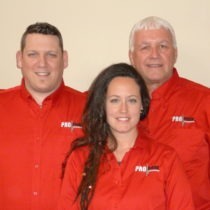 Proud Pro Post Foundations distributors and installers since February 2016, Hector, Marco and Karina Gagnon had long dreamed of owning their own business. All three were fueled by a passionate desire to integrate the business world. Ambitious and true visionaries, they decided to take on the challenge of becoming Pro Post Foundations distributors and installers. Hector, Marco and Karina think that screw piles represent the future of the construction industry, and that consumers and businesses will soon be requesting these products. Rather than going for traditional concrete foundations, why not choose the simple, quick and efficient solution we offer? The three partner’s various and distinctive professional skill sets are all put to work in their daily business dealings. For example, Hector, who was previously a forestry operations manager and supervisor for Rexforet, relies on his business management skills in order to offer a great client experience and to ensure the business is well managed. When asked what separates Pro Post Foundations screw piles from the competition, the three partners said it was undoubtedly the Kubota mini-tractor, a performant and multitasking piece of equipment that allows them to offer clients impeccable services. The mini-tractor can tackle all types of terrain and can access even the most difficult to reach places! They also insist on the fact that this mini-tractor will not damage the client’s property and will leave virtually no trace of its passage! Hector, Marco and Karina are proud of their many realisations, and always strive to offer quality services. One of their favorite projects involved the building, in collaboration with the MAKWA Company, of sanitary facilities and a marquee for a local camp ground.